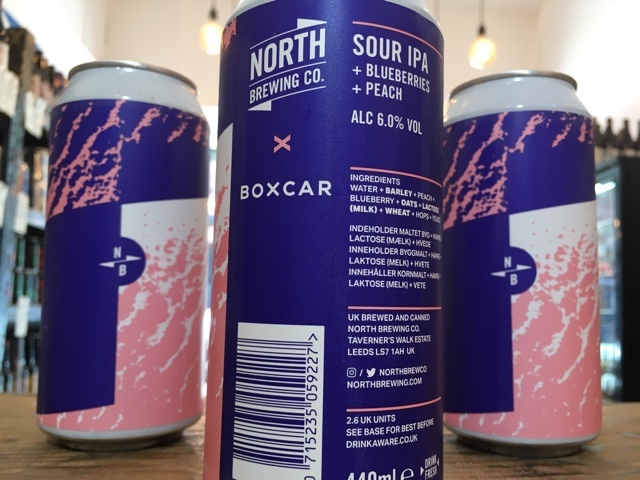 Sam from Boxcar headed up to Leeds in March for a double brew day at North. They brewed two beers using the same malt profile: one was soured and had two tonnes of blueberries and white peach added to it. The other was dry hopped in the same style that they brew the other IPAs. This beer basically has the same amount of hops as North’s regular IPAs (think Transmission) but is fruited like a Triple Fruited Gose. They then blended the two together to come up with this lip puckering sour IPA. It's fruity, jammy, with a hoppy finish.